3D printing and scanning technology has been used many times to recreate and restore many rare objects from the past, such as cars. Online magazine Classic-Car.TV is passionate about classic cars, as you can no doubt tell by the name, and recently called on Artec 3D to use the company’s 3D scanning expertise for a unique vehicle restoration project. Artec 3D detailed the project in a case study. Classic-Car.TV publishes photos, videos, and articles about classic cars, and about 300,000 international readers each month take time to enjoy the stories. But that’s not all Classic-Car.TV does – the online magazine is currently setting up a database filled with 3D models of classic cars, in order to preserve them for posterity and make sure that spare parts can be still be manufactured when necessary. Included in the database is a rare and unique 1937 Ford Eifel with a special Gläser chassis, which Artec helped Classic-Car.TV digitize with 3D scanning technology. Images for restoration of classic cars used to be captured with a stencil frame, which was placed around the vehicle and graphically scanned by slices. Then, workers would create wooden skeletons from the cross-sections of the scans in order to reproduce the shape of the car. While this is still a popular method, it’s not cheap, and in addition to taking a long time, does not always produce very accurate images. 3D scanning can save on both money and time, and produce far more accurate results than traditional methods are capable of. In addition, these scans can later be used for reverse engineering to manufacture spare parts. This feature is very important when it comes to rare vehicles like the Ford Eifel, which is missing a retractable top that can now be recreated thanks to the 3D scans taken of the vehicle. Classic-Car.TV worked to digitize the vehicle at the 1,500-square-meter MakerSpace, located in the innovation center of the Technical University of Munich. MakerSpace has several different manufacturing areas for processing all sorts of materials, like wood, textile, and metal, and Artec provided its handheld Eva and Space Spider 3D scanners for the project. 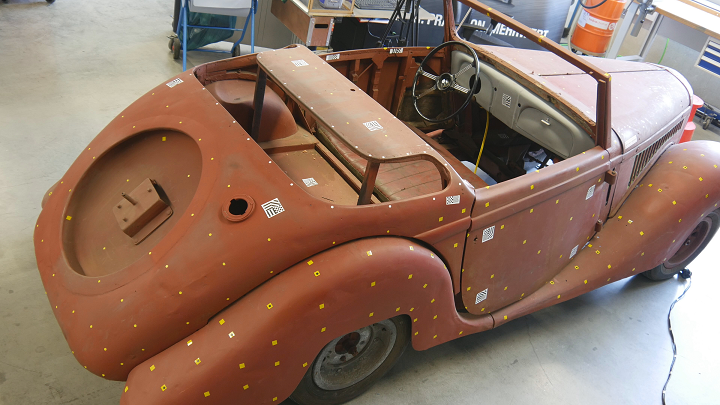 The owner of the Ford Eifel wanted to make sure that the 80-year-old vehicle’s condition was documented accurately, so 3D measurements were also taken. Scanning the interior of the Ford Eifel. The Artec Eva was used to scan the body, interior, ladder frame, and wooden frame of the car, which allowed Classic-Car.TV to take accurate digital measurements and find missing stiffeners so they could later be made separately. Additionally, the vehicle was disassembled so the Space Spider could go to work scanning parts which were harder to reach in very high resolution. The ease of 3D scanning was also helped by the fact that the car did not have a glossy finish, so the team did not have to use anti-glare spray. Once scanning was complete, all of the individual scans were aligned and fused using Artec Studio 3D modeling software, and the team checked for holes during the data processing. Only a little retouching had to be used in some angular cavities and corners, and by the end, the team had created a texture dataset, a point cloud, a polygon model, and even a 3D printed 1:4 model of the Ford Eifel. All of this 3D data will assist Classic-Car.TV in preserving the car, and the 1:1 model can be used to make sheet metal dies, spare parts, and 3D prints to restore it. 3D model of the Ford Eifel. Next, MacKenneth will be using Artec’s technology for some additional projects. “Together with MakerSpace and Artec 3D, we are working on several cases in which we can show how high-tech methods can be integrated into traditional professional restoration. This begins with the reconstruction of parts and extends to mold-making and capturing entire vehicle shapes in order to be able to recreate the vehicle in case of damage. This is very important, especially for rare vehicles,” MacKenneth explained. He also plans to 3D scan a unique Fiat 600 Elaborazione Frua, which is missing specially designed turn signal mountings on the fenders.